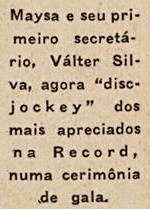 Walter Silva started 'A toca do disco' at Sao Paulo's Radio Record in mid-1958. He had worked as a speaker at Radio Nacional Paulista up to 1957. Then he became a promotion-man for new independent label RGE. 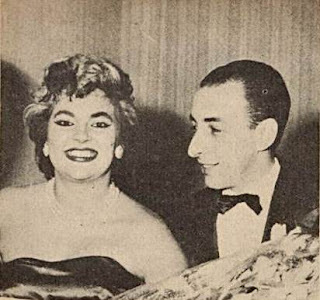 Walter was instrumental in turning Maysa into a national obsession when he became her assistant after she left her life as a Sao Paulo socialite and became a professional singer - recording a 10" album for RGE in 1956. Walter did his job so well, he was soon invited by Paulinho Machado de Carvalho to start a radio show of his own at Radio Record, the highest rating broadcaster in São Paulo at that time. Walter's style was fresh & original and a success. Soon he was poached from Radio Record by Radio Bandeirantes where he started 'O pick up do Pica Pau' in early January 1959. He left RGE to concentrate only on his radio show. Walter Silva had his best period at Radio Bandeirantes. Everywhere he went he would do the same sort of show... and he was always successful with his listeners. Radiolandia #225, 16 August 1958. Revista do Radio n. 449 - 19 April 1958. Radiolandia n. 333 - 26 March 1960. Revista do Radio n. 324 - Walter Silva & Geraldo Tassinari at Radio Nacional Paulista where he started in 1956. Revista do Radio n. 779 - 1964.